First impressions when patients enter an addiction treatment facility really sets the stage for recovery. Good room design puts patients at ease and allows them to willingly enter treatment. So, what constitutes good room design in a healing environment? Facilities should include spaces in common areas designed for group sessions; semi-private areas for family visits and one-on-one counseling; and safe, private areas for reading, resting, and contemplation. Non-institutional, welcoming, transitional furniture is a cornerstone of a facility designed with healing in mind. Therapy spaces should include upholstered furniture with comfortable fabrics. While a residential or even resort-like looks are highly desirable, achieving that look while considering how the furniture will wear over time is a special consideration. Recovery facilities are group living environments and their furniture and fixtures receive heavy use. This makes retail furniture a poor fit. Instead, contract furniture designed for heavy use and built with sanitary, cleanable health-care grade fabrics should be used to maximize safety, maximize usability, and minimize replacement cycles. A natural assumption of many executives is that contract quality furniture will be too institutional and lack the character of residential furniture. The truth is that contract seating, dining, and bedrooms are not only available in hundreds of styles including contemporary designs, but contract furniture provides safety and reliability not offered by retail furniture providers. Contract furniture complies with all consumer safety standards as well as state and local public use codes and licensing requirements. In addition, contract furniture providers offer fabrics and finishes that are designed to stay fresh and clean under constant use. Bedroom furniture may require the most special consideration because private, less supervised spaces carry the most risk. Any risk of self-harm or contraband must be managed well with storage areas that allow easy visual inspection and ligature-free furniture to eliminate any points that can be used for hanging. Whether at-risk or not, all patients expect a retreat-like escape in their sleeping space. Durable beds with innerspring mattresses finished in a cleanable yet comfortable nylon cover offer patients of any size a place to relax comfortably and safely.Recovery is a process that requires therapies led in comfortable, inviting spaces. Addiction recovery facilities more than most health care facilities require stylish, comfortable furniture that put patients at ease. Contract furniture providers offer the best fit for furnishing these spaces and considerations like safety and elimination of contraband are discreetly achieved through subtle design enhancements including health-care grade fabrics and finishes, durable construction, and bedroom furniture that offers easy visual inspection. 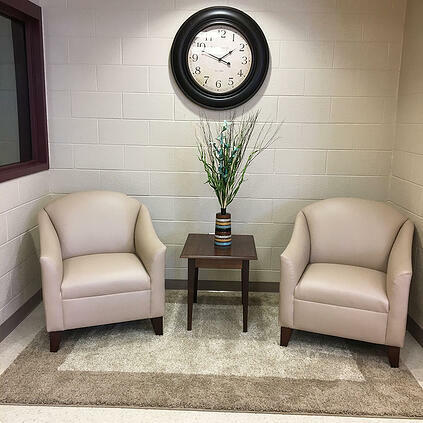 Consulting with a contract furniture expert when planning furniture for your addiction recovery facility is time well spent to achieve a world-class design that functions well for patients and staff.